PERI Clean, PERI Bio Clean and PERI Plasto Clean are liquid, chemically and physically effective concrete release agents. They can be used for standard formwork and construction site equipment, prevent rust and ensure prop and spindle threads run smoothly. PERI Clean is a semi-synthetic, non-water miscible universal release agent. Solvent-free. No discolouring of the concrete surface. Economical to use, therefore it is particularly cost-effective. PERI Clean is 57 % biodegradable within 28 days in accordance with OECD Guideline 301 F. Free of waxes and silicones. 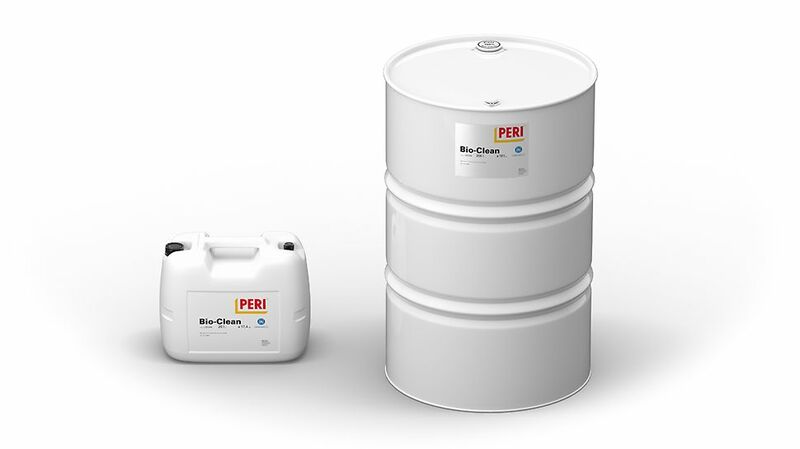 PERI Clean is suitable for Minergie-Eco (CH). Can be used for standard formwork and construction site equipment. Through additives that react with the alkaline constituents of concrete. This produces soaps which support the separation process. 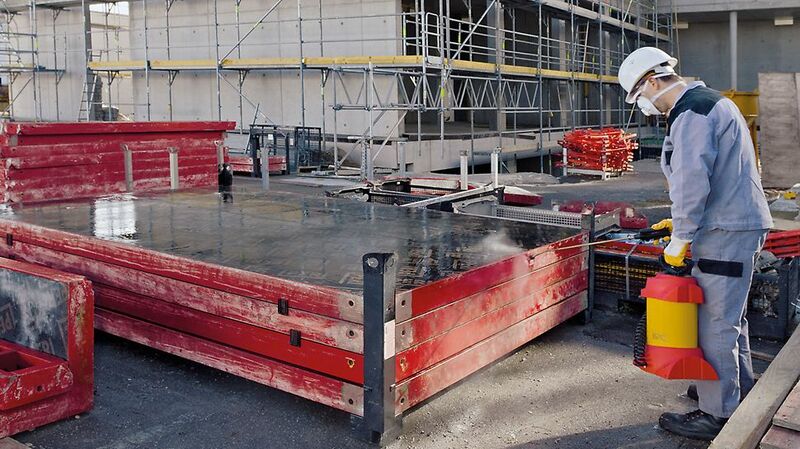 By reducing the interfacial tension between the formwork and concrete surface = water-repellent effect. For non or less absorbent formlining (formwork panels coated with phenolic resin) as well as all-plastic and plastic-coated formlining. prevents rusting of construction equipment and machinery such as concrete mixers and charging buckets. PERI Bio Clean is a semi-synthetic, non-water miscible concrete release agent. It is solvent-free. No discolouring of concrete surfaces. Economical to use, therefore it is particularly cost-effective. It is easily biologically degradable and is Blue Angel-certified (Blauer Engel) according to RAL-UZ 178. It has de-watering properties. Free of silicone and waxes. Can be used for standard formwork and construction site equipment. For non as well as moderately absorbent formlining, e.g. phenol resin sheeting, all-plastic and plastic-coated formlining sheets. ensures prop and spindle threads run smoothly. When using PERI Bio Clean in drinking water containers, the DVGW Worksheet W347 is to be taken into consideration. PERI Plasto Clean is a non-water miscible release agent, mineral oil-based, solvent-free. PERI Plasto Clean is hydrophilic and reduces porosity and cavity formation. No discolouration of the concrete surface, economical in use and is therefore particularly cost-effective. Easily biodegradable in accordance with OECD Guideline 301 c (MITI Test). Free of silicone and waxes. for all-plastic and with plastic coated formlining as well as formwork panels coated with phenolic resin. excellent results for smooth, challenging concrete surfaces. formation of pores is greatly reduced. Due to the hydrophilic properties, the surface tension is reduced and the release agent is very easily absorbed into the formlining thus achieving an excellent level of wetting.